Nancy Plax has been very involved in many public safety efforts with the 012th District, and every year works with the District on National Night Out, which is a large, fun annual gathering. This year it will be August 7th at the United Center. A big thank you to Pepsi for providing food, and drinks. C4C has been the driver of establishing a public safety task force that had its first monthly meeting in March to review criminal activity, and ways to prevent it in our community. It is a separate standing, monthly meeting of the ABLA Working Group, and the task force includes representatives from the Chicago Police Department’s 012th District, the UIC Police, area property managers of large housing developments, representatives from the Chicago Housing Authority, C4C, the ABLA Local Area Council, private security firms, and social service providers under contract with the CHA, and Related Midwest. The CHA immediately replaced its contracted security firm after the shootings, and homicides occurred at 13th St., and Roosevelt Rd. last month, and the new firm has significantly re-worked how private security is delivered. Commander Chung reported at our meeting this month that all index crimes are down 18% in the 012th District, and down in our community as well. His, and UIC Chief Booker’s leadership, and that of their officers has been exceptional. C4C appreciates being informed of crimes by community members, so if you are a victim of a crime, or know someone who has been, please contact us. Many people in our community have provided invaluable information about crime in our community. Thank you. Connecting4Communities, and the West Central Association have had two recent, very productive meetings with 28th Ward Alderman, Jason Ervin, and executive leadership from CPS to discuss increasing access to high quality public secondary education in our area of the city. We also recently met with 27th Ward Alderman Walter Burnett. C4C, and the WCA formed a committee tasked with increasing access to public secondary education in our area of Chicago. A representative from the West Loop Community Organization, who is also a parent, serves on it, as do a number of other parents in our community, some of whom have experience as former CPS teachers or administrators. We are presently vetting two possible sites, and CPS just provided us with a great deal of data to help inform our efforts. In addition to CPS data, the committee also designed a survey that we will be using to help inform our efforts. We have also met with leadership from UIC’s College of Education, which is where the current CPS CEO, Dr. Janice Jackson, received her Ph.D. in urban education leadership. Some of the people at CPS with whom we are working are professionals with whom we worked to get STEM Magnet Academy opened, and on our community efforts to support the work at John M. Smyth IB World Academy. The efforts around STEM Magnet Academy, Smyth, and a new high school are all part of a strategic public education plan that C4C helped to develop to make sure that Roosevelt Square, and our broader community are successful, and desirable areas in which to work, and raise children. Our community is the recipient of a great deal of recent public, and private investment totalling somewhere over $100 million which will continue to make our community a highly desirable one. An important finding that came out of the new Roosevelt Square master plan for which C4C successfully advocated was that our community desired a much better Chicago Public Library branch. The Roosevelt branch will be completed this fall, and work is well underway on Taylor Street on this beautiful new building which includes housing. The new market-rate townhomes on Grenshaw St. in Roosevelt Square, and a beautiful new SOS Children’s Villages community center across Blue Island Avenue from Smyth School will also break ground soon. The grand opening of the renovated Medical District Apartments, renamed Scio at The Medical District, is this week. Work on a beautiful new athletic facility at St. Ignatius College Prep has begun south of Roosevelt Rd., and work on a beautiful new Chicago Park District recreational facility on Addams Park will soon begin. The West Loop is also receiving a new Chicago Public Library branch because of efforts by community organizations there. The new leadership at CPS has made it clear that it takes our high school efforts very seriously. There is more work to do, and media outlets have been following our efforts. We believe we will have success. We have made it very clear to CPS that increasing access to high quality public education is critical for the continued growth, and stability of the West Loop, and for the future success of Roosevelt Square, and West Haven as the Chicago Housing Authority continues to redevelop these sites. Mayor Emanuel’s Office, and Alderman Ervin have worked diligently with the CHA, and local community institutions to move Roosevelt Square forward in a very productive manner. We are grateful for their support of our community. We would also like to thank Ald. Ervin for spending a significant portion of his menu money to replace sidewalks, and parkways on the blocks near the Shrine Of Our Lady of Pompeii, and Notre Dame de Chicago after Peoples Gas damaged them in their gas line replacement work, and a big thanks to Little Italy resident Phyllis Mategrano for coordinating, and helping her neighbors on Flournoy St. to plant beautiful flowers, and other plantings in the new parkways on her block!!! Our community has been victimized recently by a wide spread violent, and non-violent crime wave, as have many other Chicago communities including the South Loop, the West Loop, the Near North Side, and Lincoln Park. A number of people have also reported seeing, or stopping criminals from stealing packages left on door steps in our community. Please be careful, be alert of your surroundings when out doors, and make sure your home is secured. Please report suspicious activity by calling 911. Saturday, December 2 between 6:30 – 7:00 p.m. a valet parking cars for the annual Christmas Concert at the Shrine of Our Lady of Pompeii was the subject of an armed car jacking. This is the oldest continuing Italian American church in Chicago, and it brings visitors, and worshipers from all over the Chicagoland area, and beyond. Being car jacked does not say welcome to our community. Saturday, Dec 2 at 12:30 a.m. Burglary: attempted forcible entry on the 800 block of South Bishop St. If someone is home this is really an attempted home invasion, which if the perpetrator is armed can be particularly dangerous. The following three armed robberies were reported on the nightly news recently. The robbers were described as three-to-five black men, thought to be between the ages of 18 and 25, standing between 5-foot-6 and 6-foot, and weighing between 145 and 160 pounds, police said. Dec. 2 at 9:22 p.m. Wednesday in the 900 block of South Lytle. On Saturday, December 9 around 6 p.m. there was a carjacking on 1400 block of west Lexington St. A woman was violently wrestled to the ground reportedly by four black males, and her car was stolen. It is unknown if the alleged criminals were armed. C4C worked with former 012th District Commander Melissa Staples, Related Midwest, the CHA, and the Mayor’s Office to successfully reduce gun violence in our community in the past. The program was so successful she wanted to implement it City-wide at CHA sites, but she, and her top Chicago Police Department colleagues encountered some bureaucratic resistance. Unfortunately we lost her exceptional leadership of the 012th District for some time. Now that we have new, effective leadership at the 012th District we will work with our Commander, and the Chief of UIC’s Police Department, as well as other institutions to continue that work. A former employee of the Illinois Medical District responsible for developing a security plan for the IMD with law enforcement has reported extensive holes in security for this important institution that need to be addressed, and there are issues with effective lease enforcement, and other property management with other subsidized developments in our community, including the Barbara Jean Wright Court Apartments that we are addressing with HUD. This work is ongoing, and painfully slow due to institutional inertia, and corruption in Chicago that we all read about seemingly daily in our newspapers. This corruption negatively impacts our access to high quality public education, public safety, and other important aspects of our quality of life. If you have any additional information about crime, or suggestions you believe may be useful, please contact us. Sunday’s Chicago Tribune, in the first of a series of extensive Special Reports on public secondary education in Chicago, mentioned C4C’s efforts with the West Central Association to obtain a high school for our rapidly growing area of Chicago. C4C, and WCA have formed a public education task force that includes representatives from the West Loop Community Organization, Neighbors of the West Loop, and other residents with skill sets in education to advance this effort. The Tribune’s report gets at underlying issues with which our community has been dealing since the mid-1990’s, and they’re ones of institutional corruption, and ineffectiveness in planning. In 1996 the University of Illinois at Chicago issued a request for proposals for a master developer to develop the UIC South Campus. That same year HUD awarded a planning grant to the Chicago Housing Authority to plan the redevelopment of the CHA’s ABLA Homes. We asked UIC to help our community plan for the impact of big demographic transformations these two large developments would have on public education, but UIC refused. Not surprisingly, one of the South Campus developers, and the former Chief of Staff for then Illinois House Majority Leader, Lee Daniels, who UIC hired to oversea the UIC South Campus development, were later convicted of felonies. It seems nearly criminally negligent that the largest public urban university in Illinois would not care one iota about public education in its own backyard or the impact these large developments would have on the children who would live in them. Similarly, UIC, CPS, the CHA, and even legendary civil rights attorneys who were all engaged at various levels in the ABLA plan ignored public education planning choosing instead to continue to perpetuate racial segregation in public education in our community by closing four miserably failing public elementary schools to consolidate them into Smyth Elementary. This was contrary to both the Gautreaux, et. al. v. the CHA case filed in August, 1966, an important underpinning of which was the 1954 Brown v. Board of Education of Topeka, Kansas case, and the ideals of HUD’s HOPE VI Program, and enabling federal legislation, one of the largest changes in U.S. federal housing policy in our nation’s history which funded the ABLA transformation. In the intervening two decades since these large developments began, our community has been left to clean up the mess made by poorly managed, often corrupt, large publicly funded institutions. We have worked collaboratively with Smyth School leadership to help transform Smyth from a failing level 3 school to a level 1 school, and organized, and led the effort to open Chicago’s first STEM School, the STEM Magnet Academy in our community. Working with the convicted felon, Barbara Byrd Bennett, who helped to continue to run CPS as its former CEO into the ground by essentially stealing public money, on our efforts to engage UIC more deeply in Smyth School was an enormous challenge for C4C, but we have had some success. Getting CPS to address the issues with lack of access to high quality high schools in our rapidly growing area likewise will not be easy, but I believe CPS CEO Forrest Claypool is a skilled, professional administrator who will not ignore the needs of the rapidly growing West Loop, and our community which is also rapidly growing with exciting new developments, both on the CHA ABLA site, and elsewhere. We’ll see if Mayor Emanuel can rectify poor planning decisions by CPS in our community the way former Mayor Richard Daley was able to. Congratulations to C4C co-founder, Nancy Plax, for receiving the Cook County Crime Stoppers Community Service Award of 2017 for her work with the 012th District Chicago Police. The Crime Stoppers Annual Award Dinner was held at the Chicago Marriott on Michigan Avenue, and was well attended by media, law enforcement professionals, and community residents active in public safety. Chicago Police Department Chief of Detectives, and former 012th District Police Commander, Melissa Staples, was on hand to help present the award to Nancy. C4C has developed a comprehensive public safety campaign working in collaboration with law enforcement, and it has an important property management component that is being developed with tenant leaders of the Barbara Jean Wright Court Apartments, and the CHA’s Brooks Homes, among others. Public safety, and high quality public education are critical to the success of all communities. Not long after our high school meeting in the West Loop, Armando Chacon, President of the West Central Association, and I met with Whitney Young High School Principal, Dr. Joyce Kenner, some of her staff, some Whitney Young LSC members, including the Chair of the LSC, and some local elementary school principals to discuss possibilities for increasing access to quality secondary public education in our community using the Chicago Police Academy site, or other possible options. The meeting was a very productive one with both sides raising a number of valid points, and we agreed to continue further discussions after Dr. Kenner, and the LSC meet to review what was discussed. The West Central Association, and C4C are forming a committee of people who have school aged children, or skill sets in public education that will assist in our education work. Our first meeting will be toward the end of September. If you have an interest in serving on our committee, please fill out a contact form. Please plan to join your neighbors in the West Loop at a meeting to discuss a community call to action to obtain a new high school for the central city community to be built on the property where the existing Chicago Police Academy at 1300 W. Jackson Blvd. now sits. The Academy will relocate to West Garfield Park. Connecting4Communities and the West Central Association will host the meeting on Monday, August 28th at 6:30 p.m. at Built World Chicago at 1260 W. Madison St. There is a large parking lot for those who need to drive, but the location is only a few minutes by Divvy bike, or 15 minutes or so on foot. C4C’s Central City High School updated proposal will be reviewed, and discussed, as will a letter writing campaign to the Mayor, and select members of the City Council, similar to the one I organized when I led the effort to open Chicago’s first public STEM school, the STEM Magnet Academy. In 2010, after I discussed with then Mayor Daley reopening the unused CPS Jefferson School in our community, closed during the CHA’s ABLA revitalization planning for Roosevelt Square, a small committee consisting of community residents came together to help guide subsequent negotiations I had with the Mayor in his office, and with CPS executives for opening STEM Magnet Academy. That committee consisted of two C4C Board members, Jeff Rosen, Ph.D., and Shelley Brickson, Ph.D., along with West Loop resident, Armando Chacon, who is now president of the West Central Association, David Nichols, Paul Dravillas, and Terry Barton of University Village, and Little Italy resident, Jackie Marolda. At one meeting with CPS executives, a resident of University Village, with two children entering kindergarten who did not get into an acceptable grade school, brought along his $20,000 property tax bill, and expressed regret that he, and his wife would, in addition to paying property taxes, also be spending over $20,000 for kindergarten at a private school. It made quite an impact. A similar organizational structure, broader in scope to include West Loop residents, will be developed in our efforts to obtain a new high school. Regarding the proposed new Roosevelt Sq. Branch Library & Housing, and mixed-income housing for Taylor St., there is a small group of residents circulating a petition apparently in attempt to delay or defeat the development, and some of this group are falsely, and very naively claiming that the June, 1998 federal district Gautreaux Court’s ABLA Revitalizing Order can be altered to reduce the number of CHA low-income units required as set at 1,048 in the Order. One person making this claim confuses amending the U.S. Constitution with amending a federal district court order, claiming that if the Constitution can be amended so can a federal district court order. The Constitution, and a federal court order are two vastly different things, as are the processes to amend them. Amending the ABLA Revitalizing Order in order to reduce the number of low-income CHA units would require that someone with standing to file a law suit– it’s a very high hurdle to meet requirements of standing–demonstrate, in what would be an exceedingly expensive case, if a lawyer could even be found who is qualified who would take what would be a frivolous case, that the Gautreaux civil rights attorneys, the CHA, HUD, and the Gautreaux Court made a mistake in setting the number of low-income CHA units at 1,048, and that it should be reduced in number. There’s no basis to make such an argument, particularly since the CHA, and HUD are obligated to provide housing for low income people, and because ABLA, which was once over 3,000 units of CHA housing, had only 1,050 valid leases at the time of the HOPE VI Revitalization Plan, and ABLA Revitalizing Order. Thus, the 1,048 units is approximately the number of valid leases at ABLA in the late 1990’s, which is a reduction by two thirds the original number of ABLA units. Furthermore, this small group of people, beside running the risk of being perceived as fomenting fearmongering, entirely misses the point of a strategy that C4C developed, and successfully implemented to have 500 additional market-rate units added to the Roosevelt Sq. development in a new Roosevelt Sq. Master Plan, the development of which had extensive community engagement, the meetings for which were announced to our community by C4C. That strategy was developed because of the impossibility of reducing the low-income housing requirement, and in order to obtain what some academic survey research data seems to indicate residents of any given community in Chicago, and its metro area would deem a more desirable socioeconomic mix of housing. The Gautreaux civil rights attorneys have told me that they are in support of, and committed to having these 500 additional market-rate units added into an amended ABLA Revitalizing Order, and C4C will work with them to convince the CHA that this is the right thing to do, and that Related Midwest should develop them. 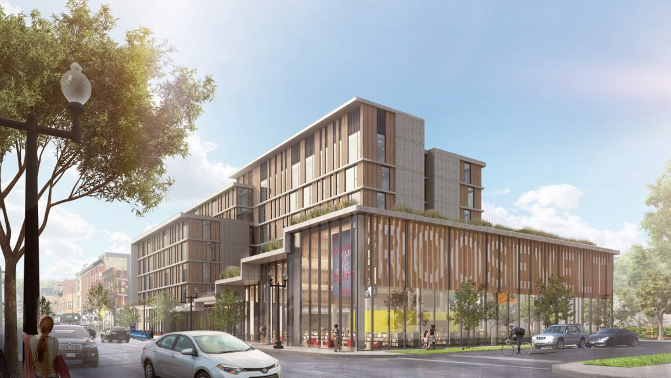 Additionally, this small group also misses the important point that a new, larger Chicago Public Library Roosevelt Branch was something that received overwhelming support from the hundreds of community residents who attended the master planning community meetings. It’s nearly certain that the petition being circulated will have no impact on the library, and housing development, and it is entirely certain that the number of low-income CHA units in the ABLA Revitalizing Order will remain fixed at 1,048. C4C will be reaching out to the community in the future for assistance implementing a strategy to have the 500 additional market-rate housing units added to an amended Order which requires that the CHA go back to court with the City, and with the Gautreaux civil rights attorneys. We will also continue our work to obtain improved management of subsidized housing in our community, and increased access to academically excellent public schools for all residents of our community. We deeply appreciate all the assistance so many community residents have volunteered to these efforts.